In a medium bowl, make batter by mixing flour, cornstarch, cayenne pepper, black pepper and salt. Add club soda and mix until well combined. Set aside in refrigerator while slicing onions. Peel onions and slice into rings of your preferred sizes. Heat oil to 350 deg F.
In a bowl or plate, pour bread crumbs for dipping. 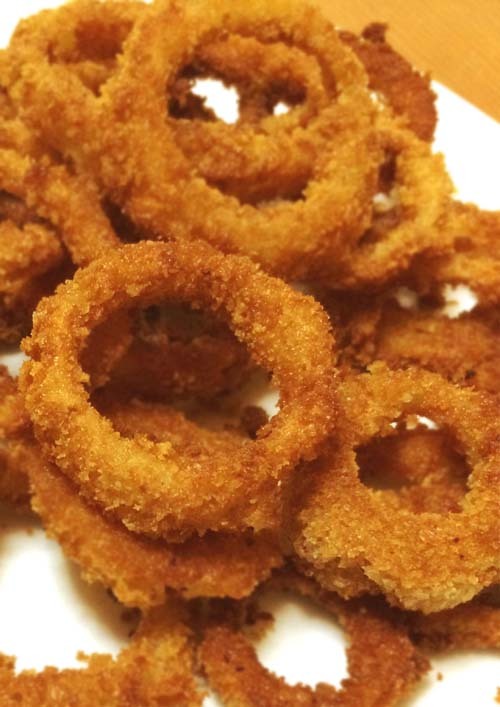 Coat onion rings with batter and dip into bread crumbs. Fry in oil until golden brown. Should only take a few minutes. Drain oil on a rack. As an alternative, a bed of paper towels on a plate will soak up oil as well. Repeat steps until you run out of onion rings. Recipe and instructions are from this video. You can also read it at www.hilahcooking.com. One thing I did different was use regular bread crumbs instead of Panko breading. Still turned out great!